Come winter and Makki di Roti and Sarsaon da Saag, will grace our dinner table at least once. Sam had spend quite a few years in Delhi-NCR area during the early days of his career. He has nostalgic memories of eating this frugal, peasant dish, at the office canteen; at road-side dhabas; and he had few good natured friends, who made sure he got a regular doze of this winter delicacy. Sarsaon da saag literally translates to Mustard Greens. 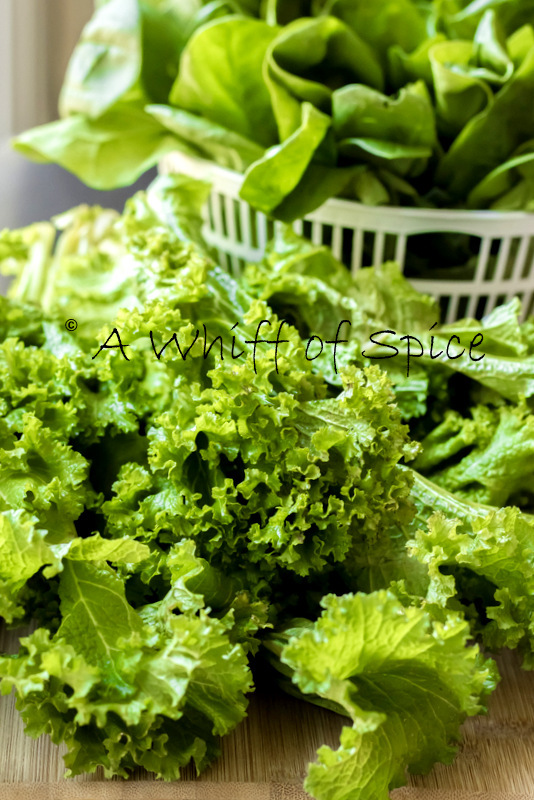 Fresh leafy greens are abundantly available in the winter months across India. Northern India especially the state of Punjab, has an abundance of Mustard Greens at this time of the year. Think of Punjab, and the image of lush green field with bright yellow flowers will pop in front of your eyes. The backdrop of many a Bollywood romance, the Mustard plant is strongly intertwined with Punjab's rural economy. Tough, bold and strangely resilient to infection and extreme weather, the plant somehow embodies the essence of the hard working Punjabi people. While Sam had sweet, nostalgic memories of the Saag (Mustard Greens), my luck hasn't been that great. Bollywood movies are the main reason the frugal combination of Makki di Roti and Sarsaon da Saag traveled from the dusty villages of Punjab to the living rooms across the length and breath of India. When I told my Mom to recreate the magic of Sarsaon da Saag in her Bengali kitchen, she, for the lack of Google Search and Punjabi neighbors, made a Bengali inspired stir-fry with the tempering of mustard seed and red chili. Now, I have been a lover of all things green from a very young age. But somehow that dryish stir-fry didn't quite leave a mark. And that was the end of my Sarsaon da Saag saga! A decade and a half later, I went to Delhi for a training, which coincided with Lohri. And since I had mentioned that I have never been a part of Lohri celebration, a colleague graciously invited me to his place and his Mom and Grand-mom fed me the most amazing Sarsaon da Saag and Makki di Roti, complete with dripping Homemade Butter and Gur (jaggery). Though that was the time when all I could cook was tea and Maggie, I made it a point to get the recipe, essentially for my Mom. Another decade later, Sam, staring wide eyed at the beautifully pilled up Mustard Greens at Jungle Jim's, sheepishly asked me if I knew how to make it. Now, I boast of a pretty good memory but even I couldn't remember it in full details. I read almost all the recipes available on the internet till my search ended here. This recipe sounded almost like the one I had jotted down 10 years ago. But of course, I had to tweak it. So instead of just dumping the greens with onion, ginger, garlic and tomatoes and cooking till soft, I sauteed the onions with ginger, garlic and tomatoes before adding the greens. 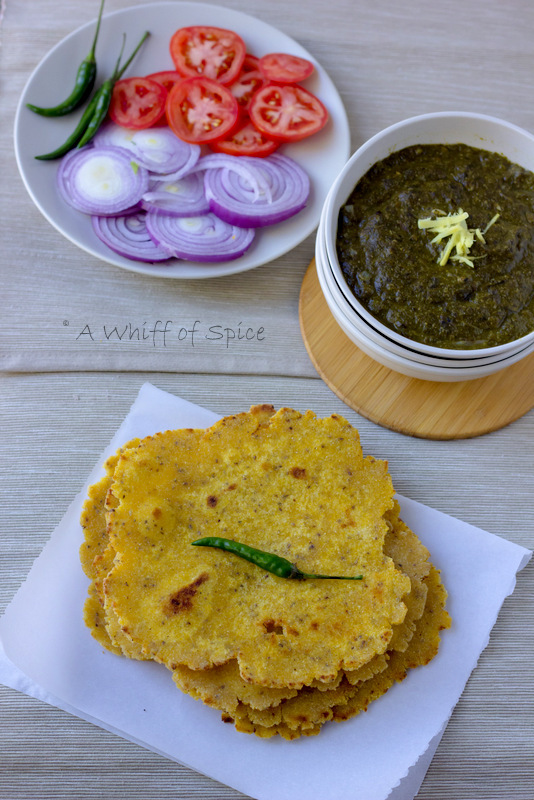 Also, since Mustard Greens are slightly bitter, Spinach and other locally available greens, like Bhatua, Mooli and Methi are added to mellow the bitterness. Since I do not have access to other kinds of green, I have used just Mustard and Spinach greens. Like my Mom's Bengali style stir-fry ruined the Sarsaon da Saag experience for me, Makki di Roti was ruined by a then newly opened restaurant called Mehak-e-Punjab almost two decades ago. 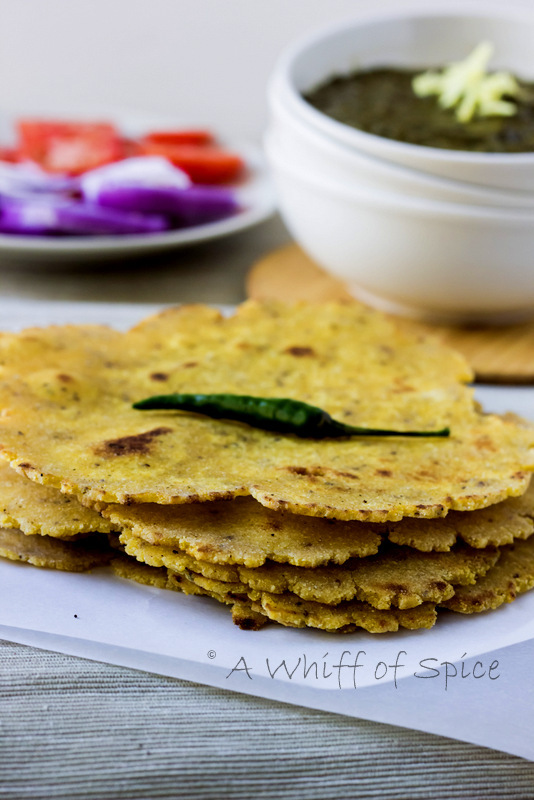 Makki di Roti is an Unleavened Flatbread made from Makki ka Aata or Cornmeal (or Maize Flour). Cornmeal or Makki ka Aata is naturally gluten free. That makes it difficult to roll and it turns brittle when cold. Hence it is served piping hot and need to be consumed immediately. The one served to me at the restaurant was cold, hard, brittle and tasted like cardboard. The Makki di Roti at my colleague's place was not as hard. It was still soft even when slightly cold. "The secret lies in adding a little Gehun ka Aata (Whole Wheat Four)", told his Grandma with a grin, when I marveled at how soft the rotis are. And that's a little trick that I have been following ever since. Addition of Whole Wheat flour, keeps the rotis soft and also helps to roll them a little better. Traditionally, the greens are gently simmered over the low heat provided by cow dung chips burning in an angithi or chullha (coal or wood burning portable stoves) and mashed by wooden masher called madaani. The Makki ki Roti is cooked in the community stove called Sanjha Chulha. The whole village gathers and enjoys the dinner together. 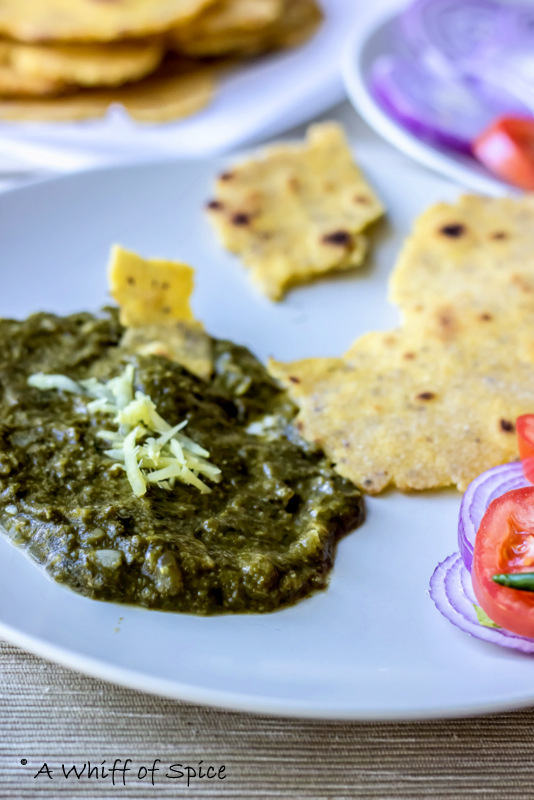 The frugal meal of Makki di Roti and Sarsaon da Saag fosters the feeling of community; of togetherness; of bonhomie. Even though we are a nuclear setup and modern day convenience of Pressure Cooker and Immersion blender has significantly reduced the prep time of this meal, still this simple fare fills our heart with warmth. Due to various chores, our dinner time are not always together. I make sure whenever I am making this, we sit together as a family and savor every bit of this seasonal fare. And create warm memories. Hope this meal does the same for your family too. 1. Prepping the greens is the most important and the most tedious part of this recipe. The stem of the mustard greens is tough. a. Remove and discard the stems from all the leaves. c. Most of the mud, dirt and other gunk would have settled bottom of the sink or the bowl. d. Very carefully and gently, collect the leaves from the top and set it aside on a colander. Take care not to agitate the water. e. Drain or discard the dirty water and rinse and scrub clean the bowl or the sink. f. Repeat the process till the water runs clean. g. Do the same thing for the spinach, except you don't have to remove the stems. h. Finely chop all the greens and keep aside in a large bowl. 2. In pressure cooker or a heavy bottomed pot, heat a tablespoon of oil over medium high heat. 3. Add the chopped onions, garlic, ginger and the green chilies and saute till the onions are soft and translucent. 4. Next add the chopped tomatoes and red chili powder and cook till the tomatoes are mushy. 5. Now add the chopped mustard greens and the spinach and a salt and keep stirring. The greens will release their water and will start wilting. 6. Now add a cup of water and cover the pressure cooker or the pot. a. If using a pressure cooker, pressure cook for two whistle on medium heat or for 6 to 8 minutes. b.If using a pot, cover and cook till the green are soft and cooked through. About 15 to 20 minutes on medium - low heat. 7. After the greens are cooked through, add the Yellow Cornmeal and give it a good stir, so that it dissolves in the hot liquid. 8. Now we need to puree the whole stuff. We can blend the greens with either an immersion blender or in a regular blender, in batches. If using a regular blender or a processor, definitely remove the plug on the lid and cover with a thick kitchen towel. This with allow the heat to vent without a creating a big mess. 9. Once the greens are blended in to a thick green velvety puddle, do a taste check and add salt as needed. Also, put it back on gentle heat. 10. In a separate small pan, heat 2 teaspoon of oil along with 2 tsp of Ghee over medium heat. 11. Add the finely chopped onion and minced ginger and fry on medium high heat, stirring continoulsy, till are onion are brown. 12. Add the fried onion and ginger mix to to the pot of pureed greens and simmer for another 10 to 15 minutes on low heat. 13. Ladle the greens in individual bowls and add a generous dollop of butter. I used unsalted Kerrygold Buter. 14. Tastes best with piping hot Makki di Roti (Unleavened Cornmeal Flatbread). But is equally good with Rotis, Parathas or Tortillas. Notes/Tip: Though traditionally, Sarsaon da Saag is a just a rough puree of Mustard and Spinach (or any other green), I often like to add pan fried Tofu. Paneer or even Mushrooms to it. 1. In a large bowl, add the yellow cornmeal, wholewheat flour, salt and dried fenugreek leaves (rubbed between the palms to make into a powder). mix well. 2. Make a well in the center and add approximately 3/4 cup of warm water. The water need not be hot. But it should be as warm as your bare hands can handle. 3. Mix the water with the dry ingredients and try to make a ball. Keep adding a little water at a time to bring together the dough. The dough should be soft yet firm. It should not be sticky wet, nor rock hard. If it too firm, add very little water and keep kneading till it reaches a softer texture. If it is too wet and sticky, add more cornmeal and whole wheat flour and knead, till it firms up. 4. After kneading, cover it with a damp towel and let it rest for 30 minutes. 5. Pinch golf ball sized dough and form into round balls. 6. On a floured surface, roll out the rotis. Rolling out the rotis is little tricky. The cornmeal is gluten free and hence doesn't have the elasticity to stretch. The addition of whole wheat flour helps but not much. The roti will crack and break and will not be evenly round. Its absolutely normal and okay. Use your palm to shape out an 'almost' even circle. 7. Meanwhile, heat up an cast iron pan. A heavy bottom pan will also suffice. Carefully place a rolled out roti on the hot pan. Cook on medium high heat. Flip the roti after 1 minute and then flip it back after 30 second. You'll see little brown spots forming. Now smear half a teaspoon or so of ghee on each side of the roti and roast it on both side till slightly crisp and lightly brown. 8. 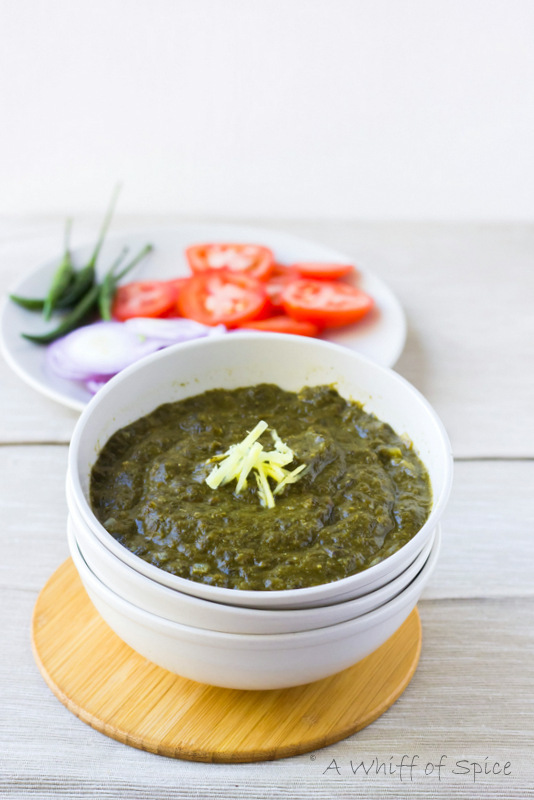 Serve piping hot with Sarsaon da Saag. Notes/Tip: Usually Whole Wheat Flour is not added to Makki di Roti. Its just Cornmeal based. Cornmeal is gluten free, and makes rolling "the rotis" a big challenge as it breaks and doesn't stretch. Moreover, once cooked, it needs to be consumed immediately, or else that become cold and too brittle and difficult to chew. Addition of Whole wheat flour, keeps the rotis soft and also helps to roll them little better. Unlike some of their fellow cruciferous vegetables, Mustard Greens have not been the direct focus of most health-oriented research studies. However, Mustard Greens have sometimes been included in a longer list of cruciferous vegetables that have been lumped together and studied to determine potential types of health benefits. Based upon several dozen studies involving cruciferous vegetables as a group (and including mustard greens on the list of vegetables studied), cancer prevention appears to be a standout area for Mustard Greens when summarizing health benefits. Chronic imbalances in any of these three systems can increase risk of cancer, and when imbalances in all three systems occur simultaneously, the risk of cancer increases significantly. Among all types of cancer, prevention of the following cancer types is most closely associated with intake of mustard greens: bladder cancer, breast cancer, colon cancer, lung cancer, prostate cancer, and ovarian cancer.